A fellow quilter gave me the NYB blocks a couple of years ago because she didn't like that they weren't turning out perfectly straight on the edges. They are made with Asian fabrics and each have Sashiko stitched lines in the center arc. Then I made a block a while ago with my stash of Asian fabrics. My sister-in-law, Willa, made some fabric 15 Minute style for another project using Asian fabrics and sent me what she didn't use. My sister, Kim, gave me a book of Japanese quilt block patterns last year for my birthday. After wondering for a long time what to do with all of this wonderfulness, I finally pulled it all together and created this piece. My husband, Tom, liked it so much, he immediately hung it in the living room. It is amazing what can happen when you spend some time playing! wow! I like the convergence of many people's creativity. Yes it is! Sort of like a traveling quilt, someone's original idea; then a little bit of creativity from the next person; then another layer from another pair of hands and before you know it a quilt has emerged! This really is a wonderful example of how to merge a mistake (horrors!) into a beautiful quilt. You did great!! 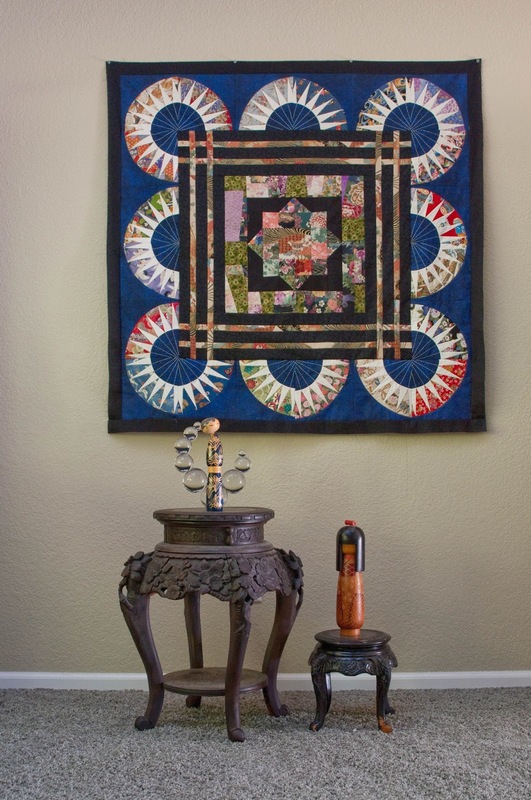 Miki, your quilt is a work of Art and looks so beautiful hanging there. 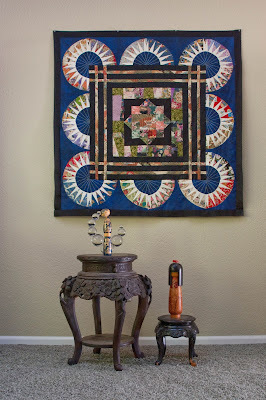 This is a wonderful work of art, Miki, a true Art Quilt, you have made such a lovely design from all the pieces. I like the way you have displayed it and photographed it too.